In 2001, Cyril Ramaphosa was approached by his former primary school, Tshilidzi Primary in Soweto, asking if he’d consider donating a fax machine. He’d be happy to, he told them, and upon returning to his former school after so many years, he saw they were in need of much more than just a fax machine. And so, the Adopt‐a‐School Foundation was born. In 2002, Cyril officially established the Foundation, together with a group of concerned individuals such as Dr James Motlatsi. The Adopt‐a‐School Foundation’s mission is to create conducive learning and teaching environments in disadvantaged schools with the support of government, the private sector, organisations and individuals. Adopt-a-School makes use of a Whole School Development model in acknowledgement and honour of each school having its own unique needs, while also recognising the importance of strategic planning when it comes to ensuring success. Strategic planning sessions enable the school to identify its areas of weakness, develop positive action plans and set performance targets for continued success in the coming years. They have also been proven to improve morale and motivation. Adopt-a-School also actively seeks opportunities to partner with other non-governmental organisations (NGOs) as well as service providers related to the various education sectors including mathematics, science, accounting, management training, librarian training, pre-school (or Grade R) education, literacy and languages. Furthermore, the Foundation addresses the basic needs of learners by focusing on aspects of social welfare, such as health and nutrition. The unfortunate reality is that many learners in South Africa go to school hungry, and to address this issue, the Foundation encourages each adopted school to grow vegetable gardens with which to supplement school feeding schemes. Extra produce can also then be taken home to the families most in need. Those eligible for social grants are assisted in applying to the departments of Home Affairs and Social Development for welfare aid, birth certificates and other governmental services. Adopt-a-School also runs a visual support programme that provides eyesight-testing clinics at its various schools. This programme supplies free spectacles to those with poor eyesight, and learners with more serious ophthalmological conditions are referred to specialist clinics. Furthermore, a hearing support programme is being implemented to identify and assist those learners with hearing impediments. To date, Adopt‐a‐School Foundation has secured partnerships with over 75 companies that have adopted schools, over 80 NGOs that specialise in various areas of development, as well as thousands of individuals who have contributed their time, money and skills. 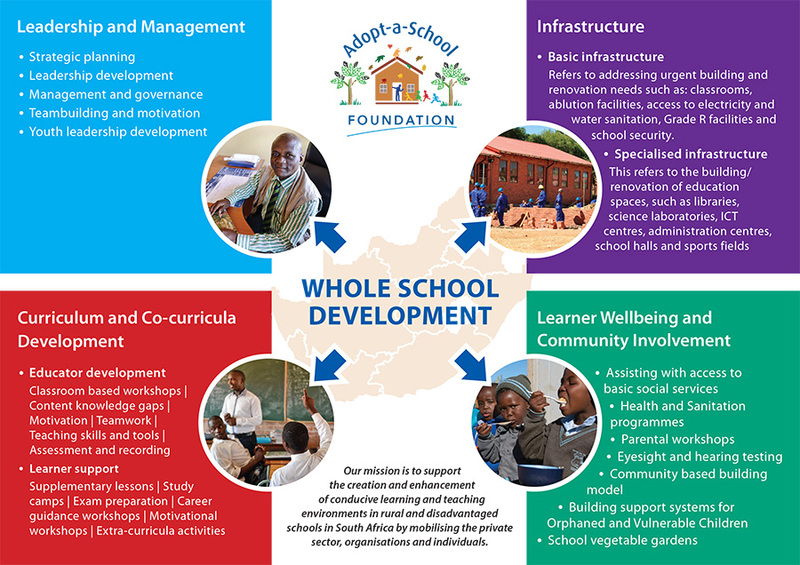 Adopt‐a‐School continues to proudly improve the educational landscape by empowering school communities, raising awareness and connecting private individuals and corporate social investment funds to South Africa’s disadvantaged schools. Since its inception in 2002, Adopt-a-School has created positive change in over 200 schools and changed the lives of hundreds of thousands of learners, teachers and communities through its holistic approach to education. The Adopt-a-School Foundation works in all nine provinces and in 2012 started working in Mozambique and Lesotho. With your support we can grow our reach and deepen our impact. We need passionate people to help spread awareness about the work we do, and to help raise critical funds for changing lives through education. Schools, companies and individuals are invited to partner with us to either adopt their own disadvantaged school, or to assist with fostering specific development programmes within our adopted schools. You can also contribute your time and skills to support our teachers and learners. Working together we can deepen our impact and give more school children a brighter future.